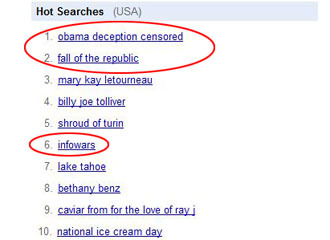 Thanks to our dedicated readers and listeners, within twenty minutes of Alex Jones’ Sunday show ending where the news broke of The Obama Deception being taken off YouTube, three of the top ten Google Trend search terms were held by Infowars, Fall of the Republic, and The Obama Deception Censored. This sudden and extreme response can only be attributed to the numbers and dedication of our audience. This is an example of just how powerful the truth is and how important each and every voice is to spreading the truth and shouting down lies and deception. On behalf of everyone at Infowars, thank you.